For other uses, see Zhongshan (disambiguation). 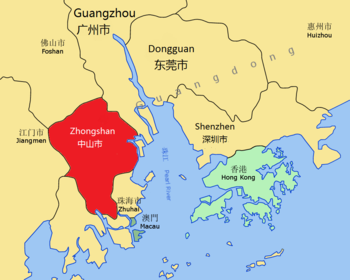 Zhongshan ([ʈʂʊ́ŋ ʂán]; Chinese: 中山) is a prefecture-level city in the south of the Pearl River Delta in Guangdong province, China, with a population of over 3 million (2012). 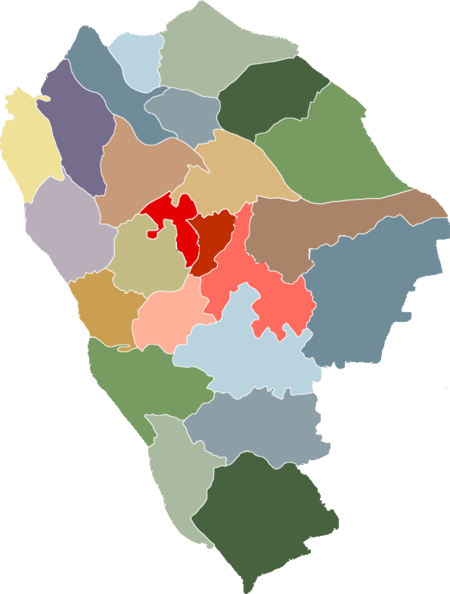 The city-core subdistricts used to be called Shiqi or Shekki (Chinese: 石岐; pinyin: Shí qí). Until 1925, Zhongshan was generally known as Xiangshan or Heung-san (Chinese: 香山; literally: 'Fragrant Mountain'), in reference to the many flowers that grew in the mountains nearby. 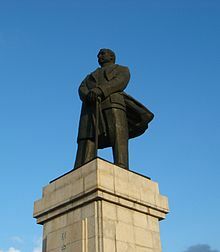 The city was renamed in honor of Dr. Sun Yat-sen, who had adopted the name Zhongshan. Sun is considered by both the People's Republic of China and the Republic of China to be the "Father of Modern China", and was from Cuiheng village – now part of Nanlang Town in Zhongshan. Nationalist and Communist units launched guerrilla attacks on Japanese forces beginning in 1942. On August 15, 1945, Japanese forces declared an unconditional surrender, and Zhongshan was liberated. Zhongshan was the scene of fighting during the Chinese Civil War and was held for much of the war by Nationalists. On October 30, 1949, however, the People's Liberation Army defeated Nationalist forces in Zhongshan, and the county came under the control of the People's Republic of China. 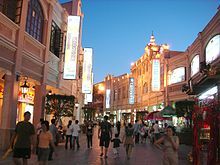 In 1983, Zhongshan was elevated in administrative status from a county to a county-level city under the administration of Foshan. In 1988 Zhonshan became a prefecture-level city. 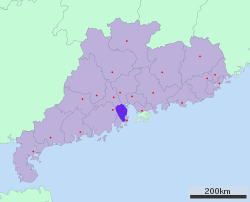 Zhongshan's location in the Pearl River Delta. Sunwen Road West (or Sunwen Xilu) in Zhongshan Old Town, a pedestrian mall lined with dozens of restored buildings from the colonial period in treaty port style. Several of these buildings were built in the 1920s. 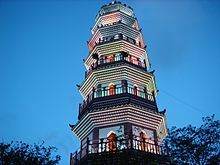 The seven-story Fufeng Pagoda, built in 1608 and visible from all over the city, is on a hill in Zhongshan Park, which abuts the western end of Sunwen Road West immediately to its north. A Sun Yat-sen memorial pavilion stands near the pagoda. Sunwen Memorial Park, at the southern end of Xingzhong Road, is the site of the largest bronze sculpture of Sun Yat-sen in the world. Zhongshan, like many cities in China, has a rapidly changing cityscape with many new buildings under construction. Currently, the tallest completed buildings in the city are the two Zhongshan International Finance Center Towers. Tower 1 and Tower 2 both reach a height of 220 meters (722 feet) and are 55 stories tall. These will be eclipsed by the Perfect Eagle Golden Square tower, which will reach 238 meters (781 feet), with an expected completion date in 2018. The International Trade Center in Guzhen Town, expected to be completed in 2019, will reach a height of 305 meters (1,001 feet) with 65 floors. Although the main ethnic group in Zhongshan is Han Chinese, there is no one dominant language or dialect spoken making Zhongshan one of the most diverse cities in China. 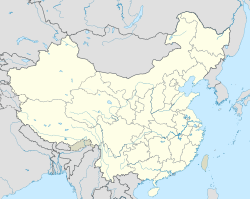 Dialects spoken in the city ranging from the more common Yue, Hakka, and Min dialects to the more local Shiqi, Shatian, Longdu, Nanlang, Sanxiang, Guzhen, Sanjiao, and Zhangjiabian dialects as well as Wuiguishan, the only Hakka dialect in the city. The most common language, however, is Cantonese. Zhongshan, Dongguan, Nanhai, and Shunde are dubbed the 'Four Little Tigers' in Guangdong. The proximity of Zhongshan to Hong Kong and Macau is an advantage to its economic development, especially in manufacturing. In the 1980s, Zhongshan had a relatively developed state-owned enterprise (SOE) sector that was used to stimulate Township and Village Enterprises (TVE) development in the countryside. Currently, the SOE sector is much weaker, and the economy is dominated by foreign investment and TVEs, and by specialized 'manufacturing towns'. Each of these towns specializes in making a particular product. Most of the towns are so successful that they earn a reputation as leading manufacturers in their pillar industries. Indeed, "One Industry in One Town" has become a unique economic feature in Zhongshan. The government of Zhongshan encourages "Research and Design" in the region by setting up national level research centres and specialized industrial regions. For example, the Zhongshan National Torch High-Tech Industrial Development Zone (中山国家级火炬高技术产业开发区) was established in 1990 in the east of the city by the Ministry of Science and Technology and the governments of Guangdong province and Zhongshan. Zhongshan Port, which ranks among the top 10 ports nationwide in container-handling capacity, is in the zone. Since 2001, it has included the Zhongshan Electronic Base of China (中国电子中山基地) for its reputation in the electronic acoustics industry. Following possible development in Nansha, the city considers its eastern part, of which 400 square kilometres (154 square miles) of land is available, a focus of future development. Currently, the city is trying to re-organize its fragmented industrialization. Meanwhile, the light and labour-intensive industry characteristic of the local economy faces the problem of a shortage of land in Zhongshan. Two natural hot spring resorts are located in Sanxiang Town, such as the national own firm Zhongshan Hot Springs Resort, which is ranked top 10 hot spring resorts in China because there is a rare hot spring reservoir in the Pearl River Delta. The World Lamp King Museum, a lamp museum in the form of a giant lamp scheduled to open in 2015, will be a major tourist attraction. Former Residence of Sun Yat-sen Memorial Museum: The former residence of Sun Zhongshan is at the center of the Memorial Museum, located in the village of Cuiheng. Xiaolan: Many houses in the town of Xiaolan have garden pavilions dedicated to the cultivation of chrysanthemums. Roofs and balconies, streets and lanes feature countless varieties of chrysanthemum plantings. Zhongshan is home to a number of forest parks which are designed to protect the natural features of the land and offer visitors a chance to get closer to nature. Zhongshan Tianxin Forest Park (中山田心森林公园) was opened in 2015 as part of the city's "green lung" initiative. Zhongshan Overseas Chinese Middle School (Chinese: 中山市华侨中学) opened in 1954, is one of the first top-grade schools of Guangdong Province (省一级学校) and the first national demonstrative ordinary high schools (国家级示范性普通高中). Sun Yat-sen Memorial Secondary School (中山纪念中学; Zhōngshān Jìniàn Zhōngxúe) was established in memory of Sun Yat-sen in 1934, and was built under the supervision of Soong Ching-ling, the widow of Sun Yat-sen.
Zhongshan No. 1 Middle School (中山市第一中学; Zhōngshānshì Dìyī Zhōngxúe) opened in 1908. Zhongshan Public Transport Group Co., Ltd. operates many bus routes throughout the city. Stop announcements are voiced in Mandarin and Cantonese on all buses. On BRT system buses, announcements are also voiced in English. By purchasing a Zhongshan Tong card from authorized retailers, riders can receive a discount of 50% on all bus rides. Elderly citizens are allowed to ride for free. Chu Kong Passenger Transport (CKS) connects Zhongshan with Hong Kong with multiple daily scheduled high-speed ferry services to both Hong Kong-Macau Ferry Terminal on Hong Kong Island and Hong Kong China Ferry Terminal in Kowloon. The trip by ferry takes about 1.5 hours. Guangzhou–Zhuhai Intercity Railway serves the city of Zhongshan at multiple stations. There is a bus service from Zhongshan to Shenzhen Bao'an International Airport in Shenzhen. Additionally Zhongshan is served by Hong Kong International Airport; ticketed passengers can take ferries from the Zhongshan Ferry Terminal to the HKIA Skypier. There are also coach bus services connecting Zhongshan with HKIA. The Shenzhen-Zhongshan Bridge will connect Zhongshan with the city of Shenzhen on the Eastern side of the Pearl River Delta. It will consist of a series of bridges and tunnels, starting from Bao'an International Airport on the Shenzhen side. Construction of the proposed 51 km (32 mi) eight-lane link is scheduled to start in 2015, with completion scheduled for 2021. Line 1 of the Zhongshan Urban Rail Transit network is a system that will consist of monorail trains that run throughout the city. The first phase of Line 1 will include 11 stations, running north to south from Gangkou Town to Bo'ai Road. ^ Tai Ping Huan Yu Ji 《太平寰宇记》, juan 157, 3019. ^ "Zhongshan - The Skyscraper Center". www.skyscrapercenter.com. Retrieved 2018-01-06. ^ "Zhongshan Torch Hi-tech Industrial Development Zone". rightsite.asia. 2014. Retrieved 13 July 2014. ^ 中山首个市级森林公园"十一"正式开放_中山日报报业集团·《中山商报》数字报. www.zsnews.cn (in Chinese). Retrieved 2017-01-26. ^ "Zhongshan Overseas Chinese Middle School". Retrieved 14 September 2016. ^ 广东省中山纪念中学简介. Retrieved 14 September 2016. ^ "Guangdong Traffic." Shenzhen Bao'an International Airport. Retrieved on May 9, 2018. 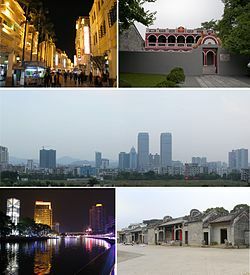 Wikimedia Commons has media related to Zhongshan. Wikivoyage has a travel guide for Zhongshan.